Pharmacopia is a lot more than natural and organic. Our wholistic approach to personal care promotes health and wellness inside and out. We are on a mission to provide our customers with authentic and indulgent products made from pure ingredients produced sustainably, locally and organically whenever possible. Our gentle infusions of herbs and oils and unique blends of antioxidants and essential oils are designed to keep skin healthy and radiant, naturally. When it comes to my family's skin, I am always VERY cautious with the products that I choose. I prefer to use natural and organic skincare whenever possible (especially with the kids delicate skin). 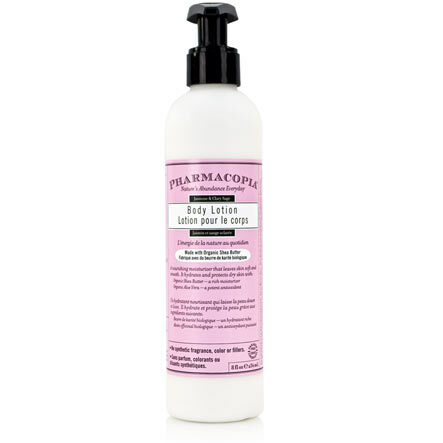 Recently I was introduced to Pharmacopia Natural & Organic Body Care. Perfectly meeting my preferences with their use of all natural and organic ingredients, I was excited to check out their product line. Their Everyday Lotion is enriched with certified organic aloe vera and shea butter to nourish and protect and skin smooth and soft. The soft scent of Jasmine Clary Sage is heavenly and wonderfully relaxing. The Pharmacopia Hand Cream is a rich shea butter based moisturizer that can heal even the driest of hands; leaving skin soft and renewed. I loved the invigorating citrus scent! This is my go to hand moisturizer right now (I take it along with me in my purse, everywhere!). As most mom's do, I wash my hands constantly throughout the day which can leave them dry and cracked. 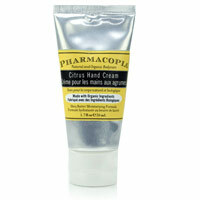 Since I've started using the Pharmacopia Hand Cream, my hands have remained soft and smooth - a much welcomed change! Pharmacopia clearly cares about their customers, using only the purest of ingredients in their amazing products... which is very appreciated by this mom!